Road Rock Lick Library. Fusion. DVD Only. Lick Library #MUSRDR0464. Published by Lick Library (HL.155097). ISBN 1495055337. 5.5x7.5 inches. Tom Quayle & Stuart Bull. Lick Library: Tom Quayle And Stuart Bull - Dual Fusion offers guitarists the unique opportunity to learn from two world class players. 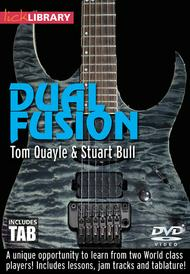 This DVD includes lessons by Tom Quayle and Stuart Bull, as well as jam tracks and tablature. In this masterclass, you'll get to sit in with Quayle and Bull as they demonstrate their unique approaches to a series of backing tracks. The lessons take you from a more traditional blues rock vocabulary to, as Stuart Bull puts it, how to step on the jazz pedal. 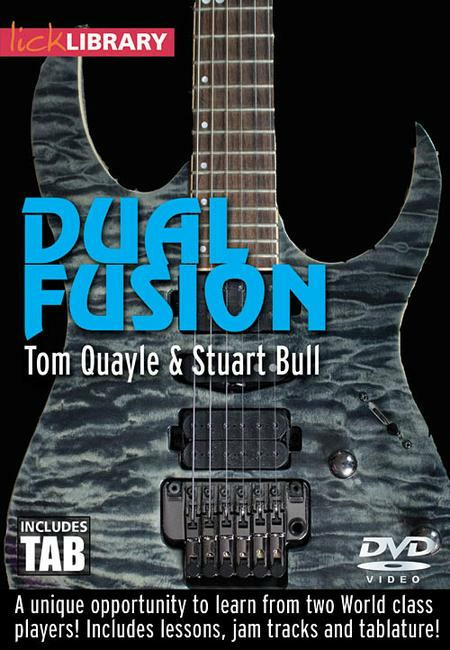 Lick Library: Tom Quayle And Stuart Bull - Dual Fusion is a one of a kind lesson in playing withanother musician in a relaxed context. You'll see how bringing the approaches of others into your own playing can help take you to the next level - an essential skill for any improving guitarist. As well as the wonderful amount of time that you'll get jamming with the two players over the tracks, with this DVD you'll also get a PDF tab book featuring all the examples transcribed for your own study.